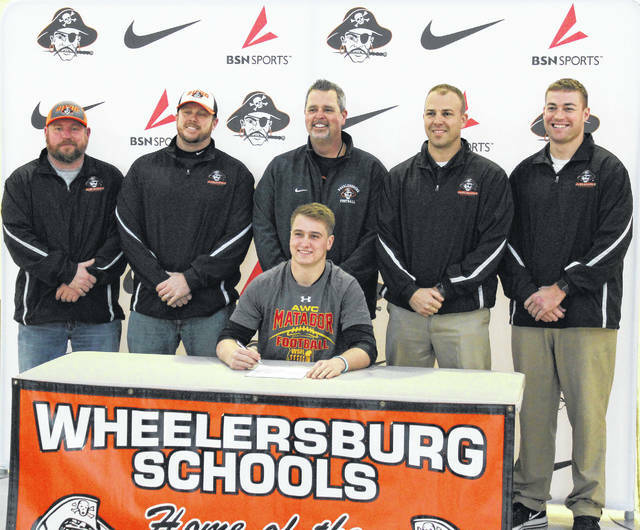 Wheelersburg’s Xander Carmichael, who starred in all three phases of the game of football during the Pirates’ state title run, signed with Arizona Western to play junior college football at the Yuma, Ariz.-based program. Xander Carmichael discuss his signing with JUCO football power Arizona Western. It is said that recruiters like all-purpose guys. However, Wheelersburg’s Xander Carmichael may be the guy that truly redefines what all-purpose means. Need a multi-sport athlete? Carmichael is your guy. Need a guy who can play multiple positions on one side of the football? Carmichael is your guy. Need a guy who can play multiple positions on both sides of the football? Carmichael is your guy. And if you need a guy who can execute a desired skill in all three facets of the pigskin, you guessed it — Carmichael is your guy. The 6-2, 220-pound behemoth of a linebacker — who pulled triple duty in starring as a blocking tight end and a ballcarrier from the fullback position on offense, as well as the 2017 Wheelersburg unit’s primary punter who could play tricks on you in a matter of seconds with his ability to pass — and who doubles as a star catcher on the baseball diamond — made his next college destination official on National Signing Day when the senior made his college football intentions official by signing with junior college powerhouse Arizona Western on Wednesday evening in a signing ceremony at Wheelersburg High School. For Carmichael, the opportunity to play at the collegiate level with one of the best junior college football programs in America, and experience a new area in the process, is a tremendous feeling considering that the senior has worked his entire life to achieve such a goal. But as far as Wheelersburg head coach Rob Woodward is concerned, it’s an honor that Carmichael is more than well-deserving of. Over the course of his high school career, Carmichael has transformed himself into one of the most feared hitters — in more ways than one — across not only the entire Southeast District, but the State of Ohio as a whole. During his last three seasons of high school football, the highly-regarded 6-2, 220-pound force earned First-Team All-Southeast District accolades in each season while proving himself as a vaunted member of Wheelersburg’s scary and nasty 4-2-5 defense. In each of the last two seasons, Carmichael garnered All-State recognition as the junior obtained Second-Team All-State honors in Division V and followed that up with First-Team All-State honors this year after leading Wheelersburg to a dream season — a 15-0 mark, its fourth consecutive SOC II Championship, and, last, but not least, the thrilling 21-14 overtime victory over Pemberville Eastwood in the Division V Championship affair in Canton. In addition to the overall result, nobody can beat how Wheelersburg found a way to win those affairs — which basically came in Hollywood fashion. When Wheelersburg trailed 13-0 against Columbus Academy at halftime, it was Carmichael who provided a monstrous spark by not only playing both ways, but completely changing the game in both facets as the senior ran for 62 yards and three touchdowns on nine carries by chewing out one tough yard after another. The senior then found Evan Horsley on a fake punt pass for a 42-yard touchdown in the third quarter that gave the Pirates the lead and completely turned the affair around. Then, against Middletown Madison, Carmichael’s tough running out of the wishbone ultimately led to the senior’s two-yard touchdown run to give Wheelersburg a 15-10 victory that got the Pirates to the Division V State Championship affair. And when the lights were at their brightest, Carmichael wasted no time making one final memory. When Wheelersburg rallied to tie the score at 14 to send the gritty contest into overtime, the Pirates turned to Carmichael on a 4th-and-1 play. True to form, the senior executed a perfect jump pass that resulted in a Tanner Holden touchdown pass over the middle of the field to allow Wheelersburg to stand atop the mountain for the first time in 28 years. But Carmichael — who finished the 2017 season with a team-high 104 tackles, three interceptions, an interception return for a score, and a forced fumble from his linebacker position, a 34.7 punt average, and 440 total yards of offense to go along with 10 touchdowns — including a perfect 5-of-5 through the air for 95 yards and two touchdowns through the memorable fake punt passes and jump passes that will forever be etched in Wheelersburg football lore — knows that he couldn’t have accomplished what he obtained without the coaching staff, who has led Wheelersburg to a 52-4 overall mark over the past four years, or fellow teammates such as Evan Dahm, who was Carmichael’s running mate as a fellow starting linebacker in the 4-2-5 scheme that has become a trademark in Pirate Country. At Arizona Western, Carmichael will be transitioning from one highly successful football program to another as the 6-2, 220-pounder will join a program that has already produced the likes of Jonathan Kongbo, Randy Gregory, and Markeith Ambles within the current decade. Kongbo was the top overall junior college prospect in the Class of 2016, while Ambles — who was a big-time receiver at Houston — and Gregory, who starred as a rush end at Nebraska — ultimately became stars at the collegiate level, with the latter being drafted by the Dallas Cowboys in the second round of the 2015 NFL Draft. Woodward, who saw first-hand what Carmichael could do in all facets of the game of football at Wheelersburg, was also impressed by his baseball acumen. A three-hole hitter who can hit for an average, the catcher certainly left his mark in America’s Pasttime, as well — leading the Pirates to a Division III Regional Final berth in the sport. And a legacy is one that Carmichael, who plans to pursue a career in engineering or law enforcement during his college days, will leave at Arizona Western. Video Caption: Xander Carmichael discuss his signing with JUCO football power Arizona Western.